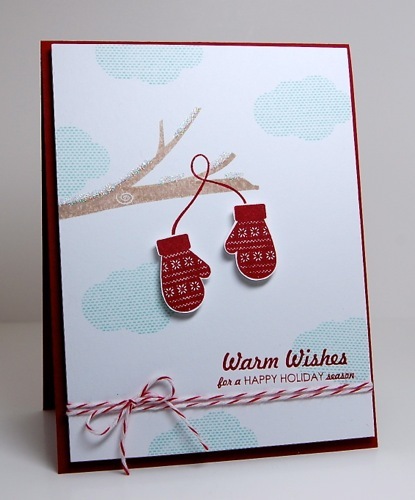 This year I am really going to TRY to make simple Christmas cards that are easy to reproduce and send! I think I say this every year, but this year I am determined & committed. My style is CAS, so it should be easy enough. The only problem is that with CAS cards comes precision and perfect placement! I often find myself with a ruler making sure everything is perfectly aligned. This does not make mass production very easy. I also need to resist the urge to add buttons, glitter and too many die cuts. I have been realizing lately that my cards involve a lot of die cutting!! The card above has been floating in my head for quite some time. Since I saw this card in fact. I love the simple design but don't think this will be a great card to mass produce...fussy cutting, glitter and twine, although I do like that the placement of my images don't need to be perfect! I'll let you know when I come up with the perfect design! This is a great card Mo! One more done!!!! You have made quite a few Christmas cards so far, good job! I agree this one may not be the perfect one to mass produce but I am sure you will find the perfect one! This is simply adorable, Maureen. I love those mittens and wouldn't have thought to hang them in a tree. The glittered branches are a sweet touch!